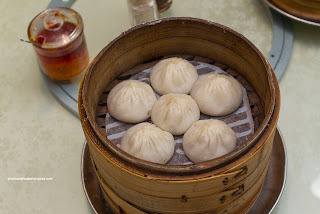 For the longest time, Chen's Shanghai Kitchen produced some of the best Xiao Long Bao in the Lower Mainland. As for the rest of their dishes, it was rather hit and miss. But that didn't stop me from going there because it was all about their XLBs (mind you, that was a bit inconsistent as well). Similar to all of the other restaurants located in the same complex, they had to relocate due to redevelopment. We now find them across from Lansdowne on Alderbridge Way under the name of Baiyulan Shanghai Cuisine. We gathered up the family and met up with Uncle Willy for lunch. Let's get right to the Xiao Long Bao first. Since we had 4 hungry kiddies with us, we ended up ordering 4 steamers of XLBs. 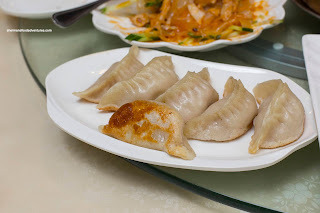 These featured semi-thick dumpling skins where the twirl on top was reminiscent of R&H. That meant it was doughy and chewy. Inside, there was plenty of soup which was sweet and porky. I found the meat filling to be moist, slightly bouncy and tender. 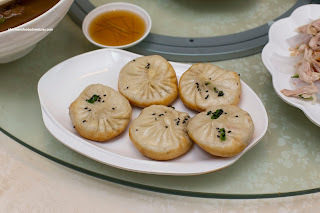 Practically the same amount of soup resided in the Pan-Fried Buns. These looked rather flat and lifeless, but they were pretty decent. I found the bun to be pretty thin and soft with a lightly crisped bottom. 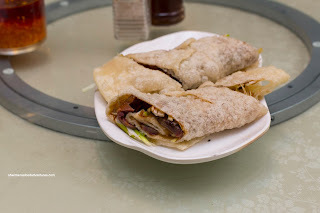 Inside, the meat filling was pretty much the same as the XLBs. By looks alone, the Beef Pancake Roll was rather pale and lifeless. Well, looks were pretty much spot-on in this case as the pancake itself was thin, chewy and dry. Inside, the sliced beef shank (wasn't very much of it) was okay though being nicely gelantized and tender. There was just enough hoisin for impact, but they put far too much scallion as it overwhelmed everything. 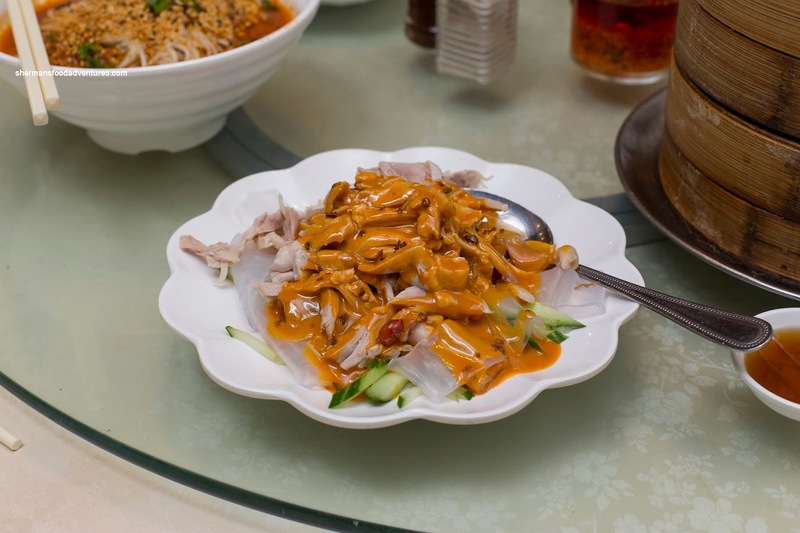 Okay, if we stay with appearances, the Mung Bean Noodle with cucumber, chicken and peanut sauce was appealing to look at. Texturally, there was not much to complain about as the noodles were slippery and chewy while the chicken was gelatinized and tender. The problem was with the dressing as it was peanutty, but without any other flavours. 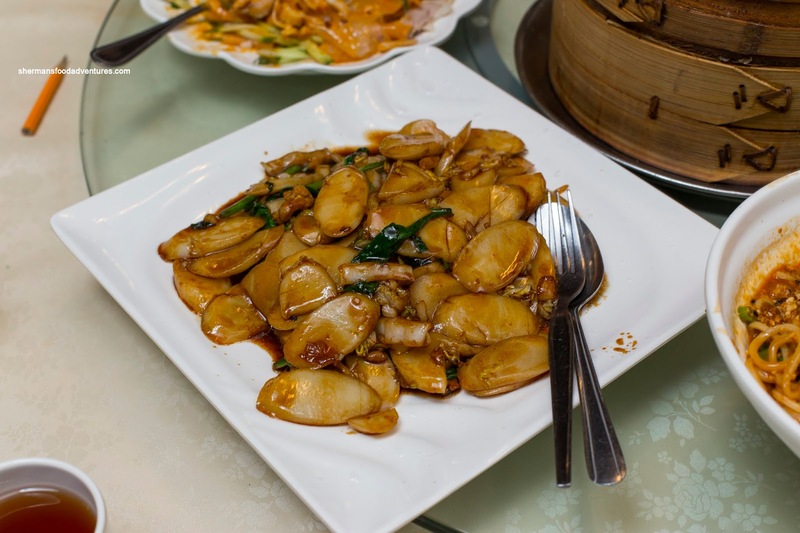 For the kiddies, they all wanted the Shanghai Stir-Fried Rice Cake, so yah of course we ordered it. This was "okay" but had a few flaws. There wasn't enough wok heat to properly caramelize the ingredients. This was exemplified by the pool of water at the bottom of the plate. Furthermore, the rice cakes were a touch soft as a result where it was missing the classic chewiness. The dish did taste okay though as there was enough seasoning and dark soy. Much like the other dumplings so far, the Pork Potstickers were not bad. The dumpling skin was medium-thick with a bit of elasticity. The bottom was decently crisped up while the pork filling was tender and moist. 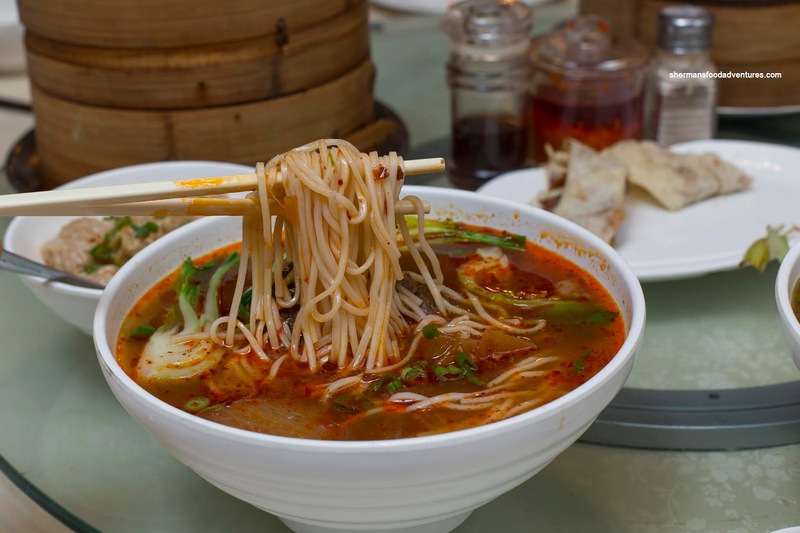 Off to some noodles, we got an order of the Dan Dan Mein. Normally, this dish is small and cannot be shared with more than a few people. 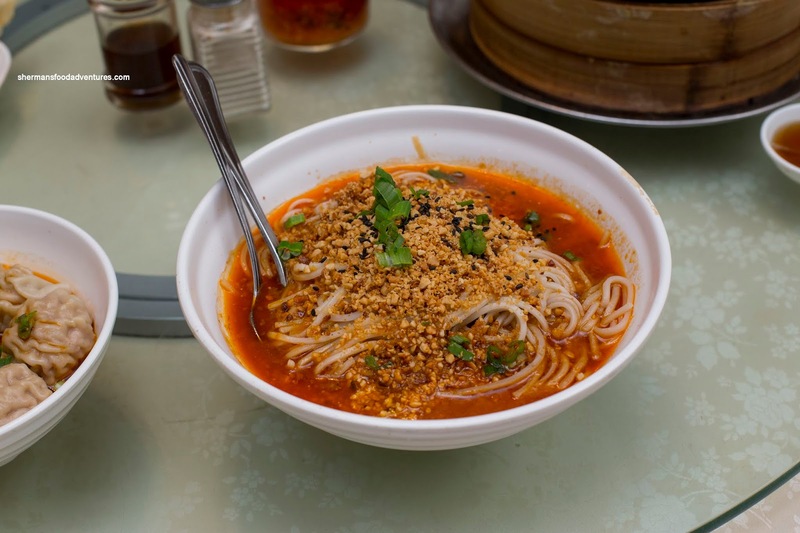 Not this one as it was pretty large with chewy noodles. On top, the ample amount of peanut sauce with chili oil was thick, sweet and a touch spicy. There was plenty of aromatics from the peanuts, but the whole thing could've used more spice and a balancing amount of saltiness. They could've ease up with the amount of sauce too as the dish became goopy. We also got one each of the Beef Noodle (not pictured) and Szechuan Beef Noodle. These were even larger than the dan dan mein. However, the beef broth base in both of them was pretty weak with very little meatiness and depth. More salt was needed too. 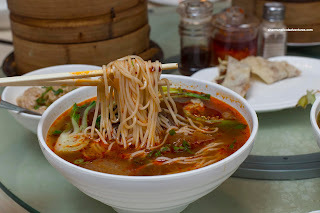 However, the Szechaun noodles did have a good amount of spice and the beef was pretty tender. 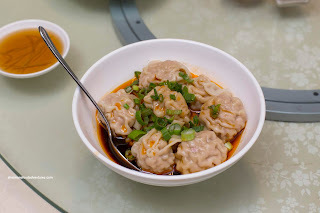 Onto more dumplings, we had the Spicy Wontons and this was a decent version. Beyond the delicate dumpling skin, the pork filling was moist, bouncy and not overly dense. The major problem with the dish was the lack of spice and subsequent impact. However, this could easily be solved with the addition of more chili oil that was available on the table. Our last dish, the Chee Fan, curiously showed up at the end. One look and it was obvious the reason why. 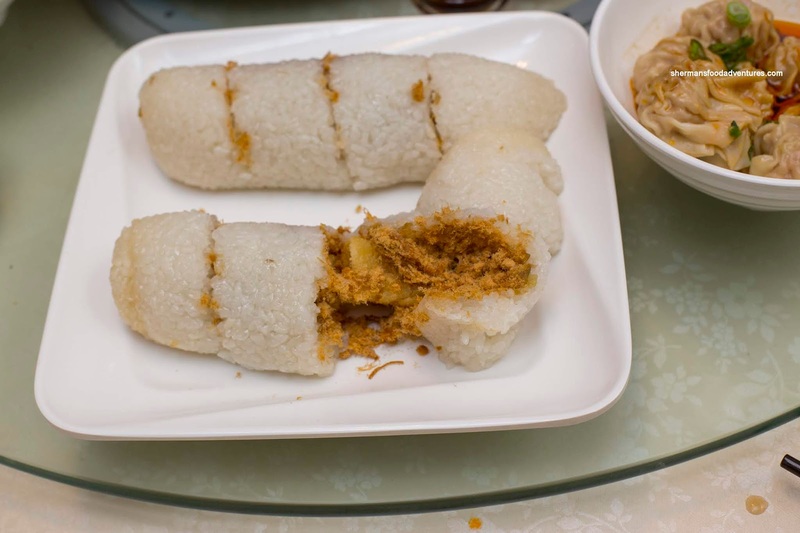 They had cooked the sticky rice just as we ordered it and before it had a chance to cool, they constructed the roll. The result was a literal hot sticky mess that fell apart on contact. It was disgusting and we couldn't believe they served it that way. In general, the food at Baiyulan was lacking in one way or another. The one saving grace was the dumplings as they were decent. With that being said, there are better to be found in Richmond (ie. XLBs at Shanghai Wonderful and Pan-Fried Buns at Top Shanghai). 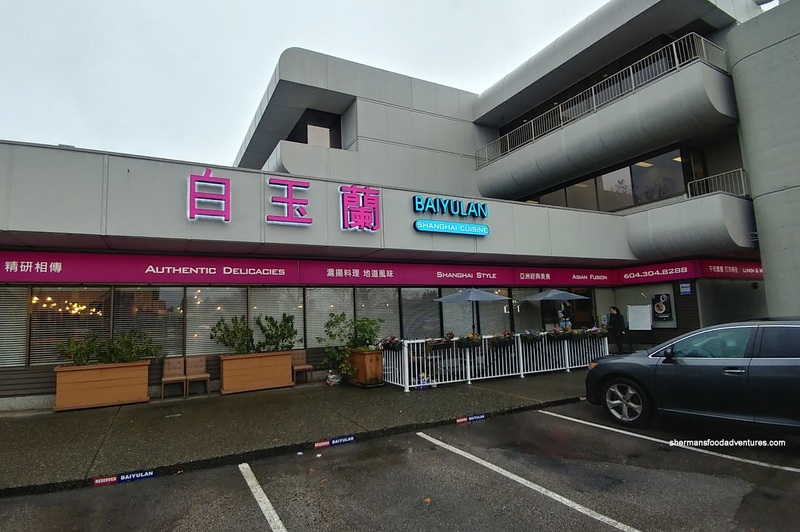 Considering those options and beyond, Baiyulan has to do a whole lot better to compete.